After hiking around Viti Levu and sailing down to Astrolabe, we dropped our buddy Kyle off in Denarau, on the west side of Viti Levu. Denarau isn’t far from the Nadi airport, so it was convenient for Kyle to leave and Thomas, David’s brother, to arrive! 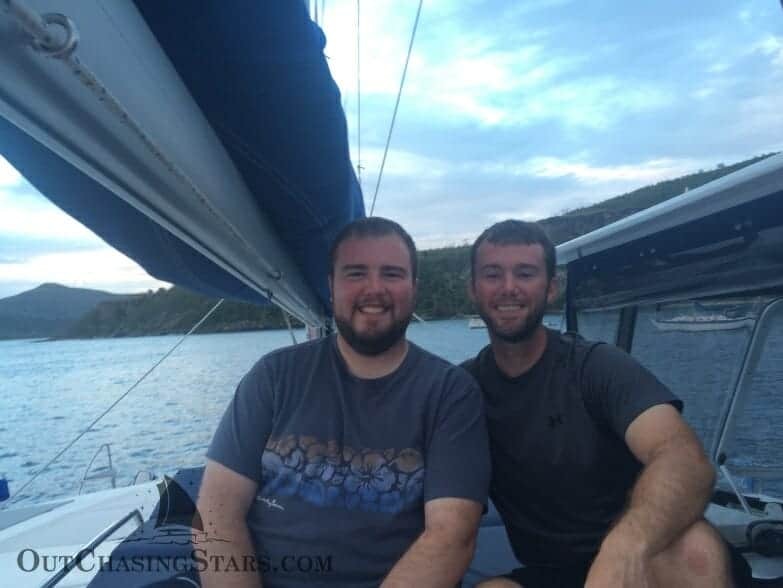 We were excited to spend a week cruising western Fiji with Thomas. David’s brother Thomas flew in at 6 am, so we met him at the port and went to grab some breakfast at Lulu’s, a coffee spot at the ship terminal. From there we took off to sail for a week around the Mamanuca and Yasawa Islands. 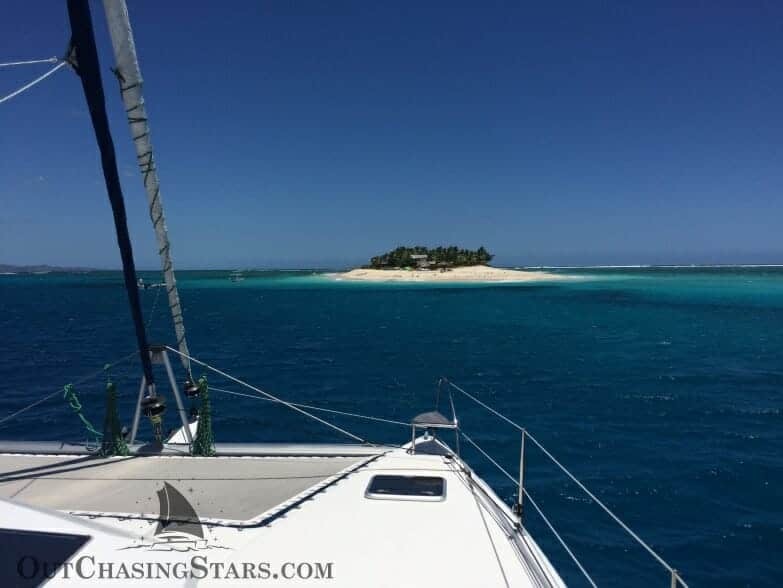 We sailed down to Tavarua, the island furthest south in the Mamanuca chain. We had coordinates for an anchorage, but it turned out to be full of mooring balls. We adjusted course for Namotu, where we joined 5 other cruising boats. There is a small shelf of sand off the island, and we dropped our anchor there. It was gorgeous, but the wind picked up to 30 knots. One by one, anchors dragged and the boats picked up and took off for sheltered areas. We had only been there about 2.5 hours, but thankfully we still had plenty of light to move. 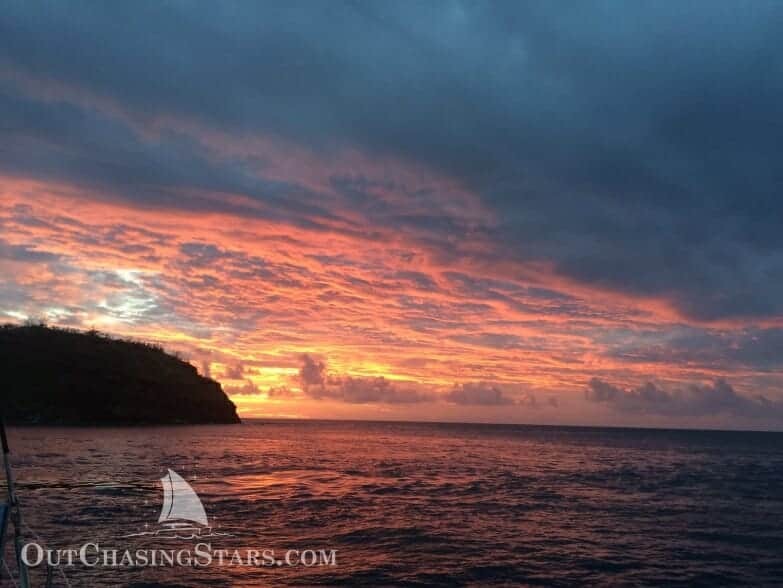 We motor sailed to Malolo island, where we followed the channel into the Musket Cove area. The whole bay is about 60 feet deep, with very obvious large coral heads. We picked up a mooring and hunkered down for the evening to ride out the wind. The next mooring we took LD into the marina and paid our mooring fee. We could walk around the area so we did, and the resort is gorgeous! 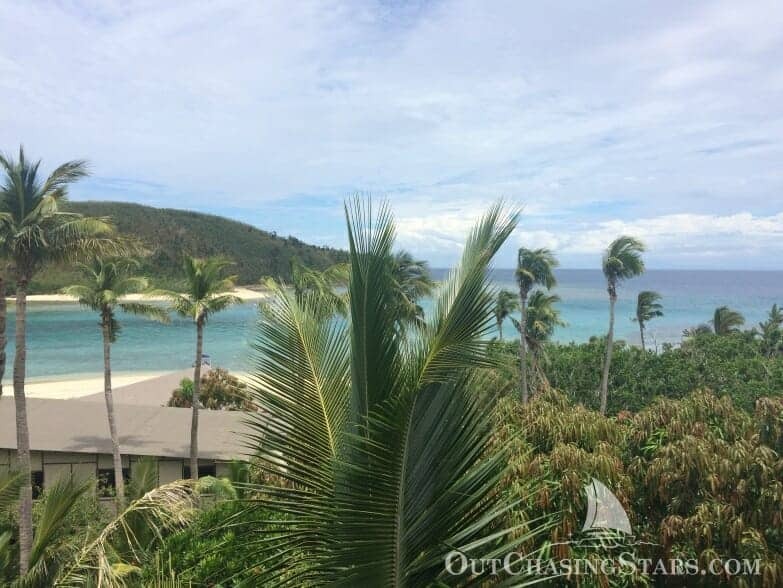 We found some small peaks to walk up and get a stunning view of the water and reefs around the island. Back at the marina we found Trader’s, a grocery store, and bought ourselves ice cream and a few local herbs. After lunch, we moved Starry Horizons further north. 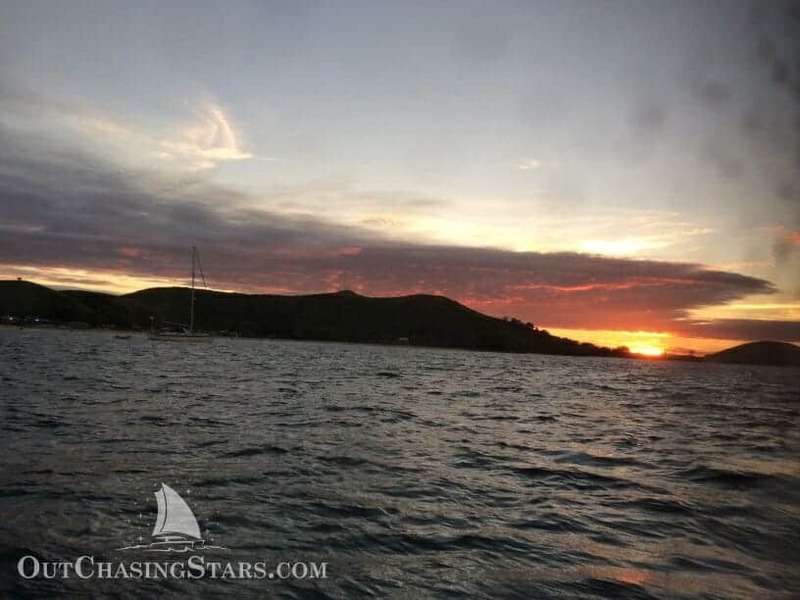 We wanted to go to Waya island, the southern island in the Yasawas group, but it was too far for an afternoon sail, so we stopped at Mana Island to overnight. I would have liked to go ashore, but we arrived in late afternoon and left early morning, so there was not enough daylight. Um, Thomas snapped this shot of SUNRISE. SUNRISE, PEOPLE. Wednesday we finished our sail to Waya and went ashore to give sevusevu to the chief in the village of Yalobi. While walking through the town, we met an older gentleman named Hoppy (sp?) who offered to lead us to the chief. We met Chief Tom, and he invited us to sit on a wooden platform with him, about the size of a king bed. We climbed up and presented our kava. Fijian words were said and we were welcomed to the island. We asked Hoppy questions, and he took us to the school’s headmaster to present some school supplies and then to his house. I asked if there was someone from whom I could buy produce, like papaya, and Hoppy opened his cabinet and gave me a perfect papaya – and he wouldn’t take money. He also tried to give me a beautiful scorpion spider conch shell I was admiring but I declined. We didn’t see many people in the village and didn’t drink kava (fine with me!). We wanted to move Starry Horizons so we were closer to the snorkeling in the pass between Waya and Wayasewa. Motoring over, we tried one spot but couldn’t stick (probably rocks or dead coral) and then moved to the pass itself. We found a good open space of sand and seagrass to anchor in. Perhaps we should have presented sevusevu at Wayasewa instead, but oh well. The anchorage was rolly since the swell rolled in at everything except very low tide. 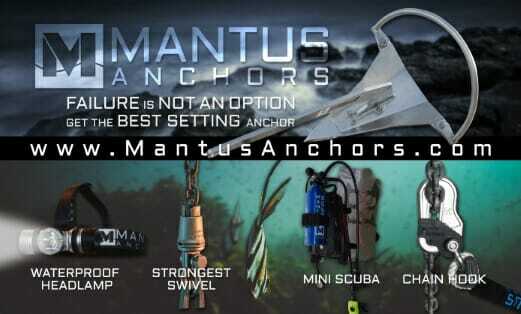 I snorkeling the anchor and around looking at things for a while. Visibility was low, but I did see three spotted eagle rays, two stingrays, and a juvenile spadefish (just the highlights). 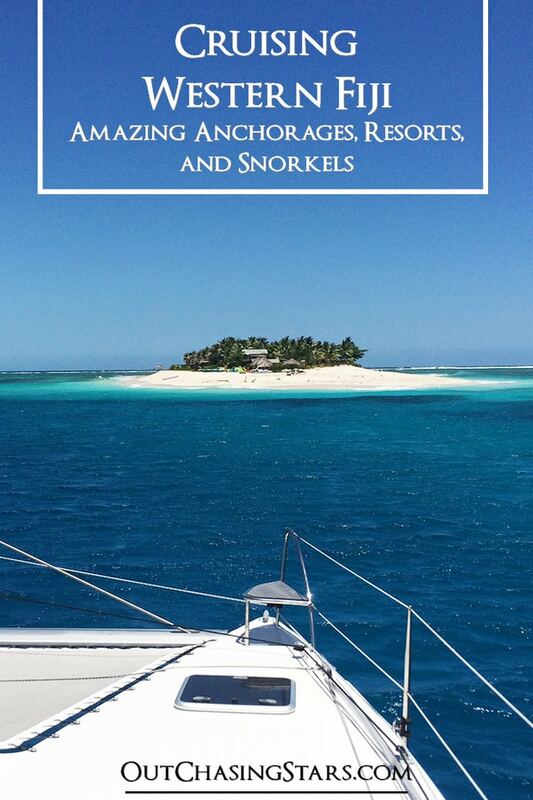 We’d read a report in the compendium from a few years ago that said this was “the best snorkeling since Fakarava”. Well, that is NOT the case anymore, we assume because of cyclone Winston earlier this year. There were a few bommies, but we could see where there used to be coral fields which are now dead. 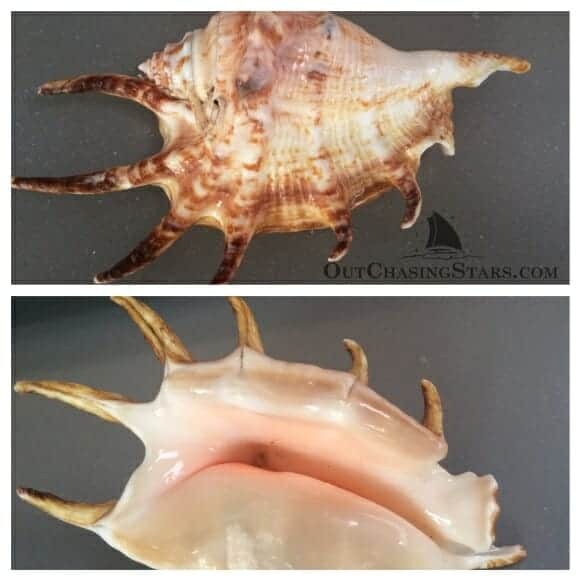 As fate would have it, David found a scorpion spider conch shell on the beach for me! We left Friday for our next anchorage – Manta Ray Resort and the pass between Drawaqa island and Nanuya Balavu island (where the resort is). The resort is named appropriately, but unfortunately, the rays only come during the winter months, and the last ray sighting was a few weeks ago. We anchored on the north side of the pass, in about 65′ of water. There were already 4 boats here, and I went around to say hello and discovered each boat was single-handed and they were all buddy boating around! A cruise ship rolled in for a few hours, taking guests snorkeling and to the beach on Drawaqa island at the pass. Saturday we snorkeled in the afternoon and I was now satisfied that we got a good snorkel in for Thomas. We snorkeled just to the east of us, dinghying north and drifting south towards the pass. The coral was really good; we saw many fish, lobsters, crown of thorns, and even a white tipped reef shark. We enjoyed a pretty great sunset on the lounge deck together. Mantaray Island Resort is small and beautiful. The staff was welcoming and helped us arrange a transfer for Thomas to get to the airport. We had dinner Friday night and attended the (free) Fijian song and dance show on the beach. Sunday was Thomas’ last day with us. We went ashore to the resort for lunch, which I thought was much better than dinner – dinner was a set menu with four choices, whereas lunch was 11 choices, which included more local cuisine. I had the kokoda for lunch. Lunch definitely provides a better view. After lunch, we headed to the beach bar to wait for the transfer. The Yasawas are pretty great for guests and tourists. South Sea Cruises operates ferries daily in the Mamanucas and Yasawas. The Yasawa Flyer starts at Denarau in the morning, then works its way over to the Yasawas and up the island chain. When it gets to the top it turns around and comes back down, so from Manta Ray, you can pick up the ferry at 11am to head north, or 2pm to head south. Or, you can arrange a seaplane to pick you up! We met a few people at the resort who are island hopping for their vacation – a few days here, then hop in the ferry up a few islands to the next resort. Waiting for the ferry to arrive. Little Dipper was a good place to sit and wait, apparently! The resort offers wifi, activities, and also has a dive shop. 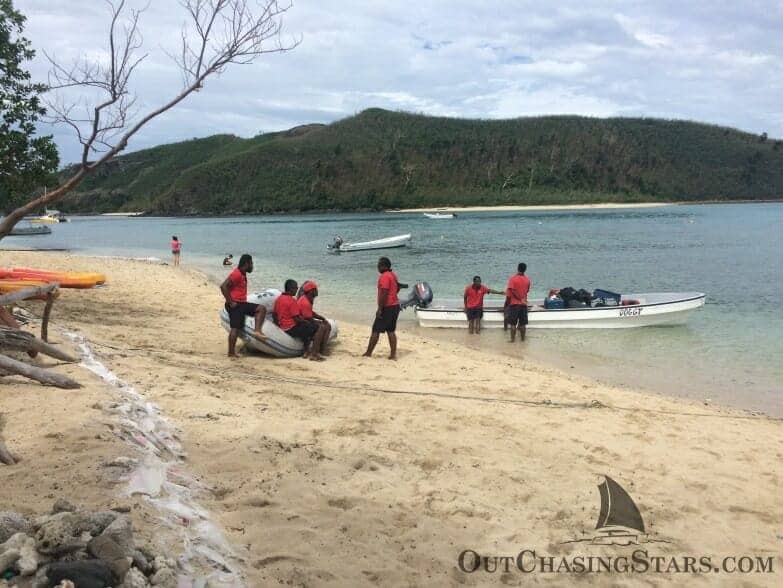 They have a special – Open Water (6 dives) or Advanced (5 dives) course for $599 Fijian. That’s a pretty great deal! The only downside was the anchorage was rolly. The combination of the swell, wind, and current creates a swirling vortex about right where we have anchored, so we’ve spun around and bounced for two days. We had a great time with Thomas and were sad to see him go! He had a nice relaxing time with us, reading, napping, and playing cards. After Thomas left we got a little lazy. We stayed anchored of Manta Ray Resort for five more nights. One night, we had all four of our single handing neighbors over for sundowners. We went out for another snorkel. I kayaked to the western facing beach behind the resort to walk along the rock outcrop. A seaplane took off literally right between our boat and the boat next to us. We watched sunsets. It was idyllic. Looking ahead, we knew we needed to get closer to Denerau to get ready to cross to New Zealand. When it came time to move we went south, to an island called Navadra. Navadra is a deserted island, but home to a herd of goats. We spent three nights at Navadra. 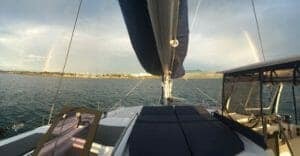 We met our neighbors the first night, a 59′ Outremer named Moana, with seven Swiss guys on board enjoying a few days of Fiji before heading south. The next night, we shared the anchorage with a motor yacht named Encore, who set fireworks off from both the stern and the beach. The third night we were all to ourselves. During the days, we snorkeled (twice) and hiked the island, trying to see goats (we did see them, but they are good at keeping a safe distance). While there wasn’t a weather window that we wanted to take to NZ yet, we were starting to run out of basic provisions, so it was time to get moving. I was out of butter, flour, and eggs. Whoops! Next stop: Vuda! Update: we enjoyed cruising Fiji so much, we returned for a second season in 2017. 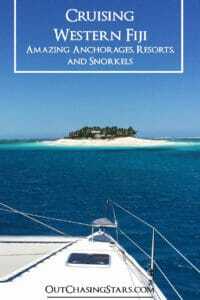 Here’s our post about Cruising Western Fiji Again. Gosh – looking at the picture of David and Thomas, you’d never guess they were brothers! Sounds like Thomas had an idyllic vacation. You guys are amazing hosts!! I know! They look like brothers. We had a great time. Great update. It sounds like Thomas had a good visit. Stay save through the weather! Thanks mom! All clear here now.